Prospective buyers in search of a second home often gravitate toward resort-style destinations that offer warm weather, incredible amenities, access to the beach and breathtaking scenery. The only problem, of course, is that affording a second home in such a desirable location often comes with a hefty price tag. Believe it or not, Belize is one tropical hotspot that offers reasonably priced real estate and a relatively low cost of living. This translates to an affordable slice of paradise that you really can fit into your budget. Take a closer look at just how achievable it is to enjoy affordable living in the tropical paradise of Ambergris Caye, Belize. Anyone making plans to invest in a second home in an international destination must first thorougly understand the overall cost. Buying a beachfront property to use as a vacation home might sound like something only the extremely wealthy can do, but that isn't true in Belize. Just $129,900 is enough to purchase a condo located just steps from the beach, and there are a variety of options at Grand Baymen ranging in size, layout and style to best suit your budget. Best of all, anyone not using their second home all year can opt to rent it out for a source of supplemental income, a great way to boost revenue while enjoying the perks of a second property. When you're relaxing at your vacation home, you don't always want to stick to a tight budget. You should be out at great local restaurants, experiencing regional cuisine and making the most of your getaway. It makes sense, then, to spend your leisure time in places that don't cost a fortune to eat out in restaurants or enjoy a few drinks at welcoming bars. 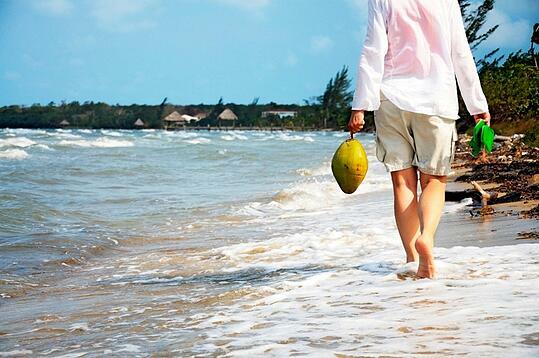 Ambergris Caye, Belize, is the perfect choice. You'll have a wide range of local and international restaurants, bars and cafes, but the prices are much lower than you might expect from a beachfront destination. Vacationing in a major city might include the cost of museum tickets, pricey meals at upscale restaurants, gallery admissions and perhaps some expensive souvenir shopping on your day of sightseeing. In contrast, spending time on Ambergris Caye allows you to enjoy entire days of fun activities at no cost. Owners of vacation homes at Grand Baymen, for instance, might spend their days lounging by the pool, practicing yoga outdoors, working up a sweat at the fitness club, playing tennis, strolling along the shoreline at sunset or going for a dip in the ocean, all of which are available within walking distance. While you likely have a good healthcare system where you currently live, it's smart to consider what your options will be overseas. If you want to spend a few weeks or a few months each year at your vacation home, local medical attention is certainly a major consideration. The good news for anyone eyeing property in Belize is that healthcare is affordable and of high quality, ensuring you don't have to spend a fortune if medical assistance is needed. A vacation home in a tropical destination and an affordable way of life are not mutually exclusive. At Grand Baymen in Belize, it's still possible to afford the vacation home of one's dreams without paying the premium that comes along with other Caribbean islands.